I haven't done any work for the last three days, I put my back out again, crawling around on my knees repairing the swimming pool surround, quite how I did it, I have no idea, but Saturday night, I thought it was as Doctor job, however Dr. Marcela worked her magic and I am getting back to normal slowly. Today, I had 10 minutes to spare, whilst waiting for lunch, and decided that it was time I sorted out my drill bits, something that has never been a priority, and I have wasted many hours over the years looking for the right drill bit. 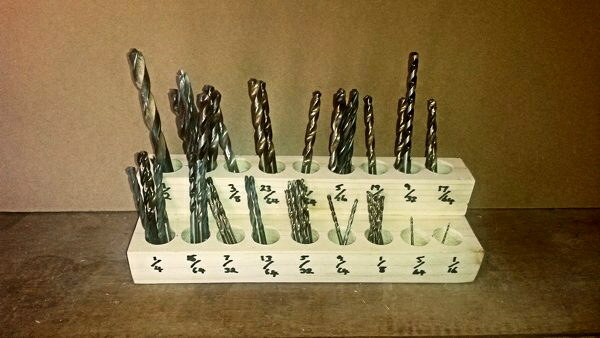 All it took were two pieces of scrap 4 x 2, one cut down to 1 1/2 x 2, and glued on top of the larger piece, then using a 1" forstner bit, drill as many holes as possible, and mark the drill sizes on the outside...Job done!! When I have a few more minutes to spare I will make two more, one for masonry bits and another larger one for my spade bits.